Mega Sale! Free Shipping Included! 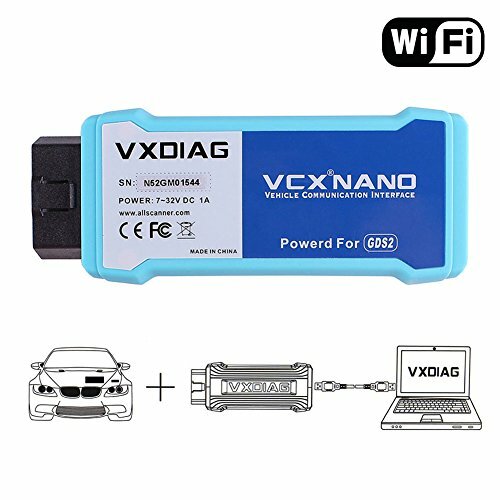 Save 27% on the VXDIAG VCX NANO Vehicle Scanner for GM/OPEL GDS2 Tech2 Car Diagnostic Tool WIFI version by VXDIAG at Lazaranda Dallas. MPN: VXDIAG NANO GM/OPEL ?wifi?. Hurry! Limited time offer. Offer valid only while supplies last. Notice: 1. The software of VXDIAG VCX NANO for GM includes two parts: tech2win and GDS2. Version of tech2win: V33.003; Version of GDS2: V2016.1.0 2. 1. The software of VXDIAG VCX NANO for GM includes two parts: tech2win and GDS2. VXDIAG VCX NANO is PC-to-vehicle interface compatible with multiple software applications, and it is the only full-spectrum diagnostic and reprogramming tool capable of servicing new Delta and Epsilon vehicles (with auxiliary CAN bus that cannot be serviced by Tech2). 3. Protocols: Mixed fleet capabilities with broad protocol support, All current and most legacy vehicle protocols: CAN, UART, KW2000, Class2,for GM LAN, etc. Part Number: VXDIAG NANO GM/OPEL ?wifi? MPN: VXDIAG NANO GM/OPEL ?wifi? If you have any questions about this product by VXDIAG, contact us by completing and submitting the form below. If you are looking for a specif part number, please include it with your message.